Izmir – is the 3rd largest city of Turkey on the Aegean coast in Asia Minor. Ancient name of the city is Smyrna. Bodrum – is the site of the ancient city of Halikarnassus, the location of the famous Mausoleum of Halikarnassus (built after 353 BCE) – one of the Seven Wonders of the Ancient World. Unfortunately, the ancient monument was destroyed by earthquakes in the Middle Ages – some of the remnants can be seen in London’s British Museum. The project is for the Embassy of Turkey in Zimbabwe. They wanted to print some promotional t-shirts with concepts on Turkey so I thought it would be fun to do some simple line drawings of famous cities. Well, each of those cities are very popular and have very iconic landmarks and structures. So it was just a matter of putting them together. Istanbul – is a city in Turkey that straddles Europe and Asia across the Bosphorus Strait. The Old City reflects cultural influences of the many empires that once ruled here. In the Sultanahmet district, the open-air, Roman-era Hippodrome was for centuries the site of chariot races, and Egyptian obelisks remain. Ankara – formerly known as Ancyra and Angora, is the capital of Turkey, located in Central Anatolia. With a population of 4,587,558 in the urban center (2014) and 5,150,072 in its province (2015), it is Turkey’s second largest city behind Istanbul. The inspiration behind this project were the different cities of Turkey. I also really love line drawings so I thought it would be a good combination. I’d say my style is probably fun and happy:) I really love typography and the clean simplicity of Scandinvian graphic design. In terms of inspirations I love traveling, seeing new places, visiting different countries. Antalya – is the eighth most populous city in Turkey and the capital of its eponymous province. Located on Anatolia’s flourishing southwest coast bordered by the Taurus Mountains, Antalya is the largest Turkish city on the Mediterranean coast with over one million people in its metropolitan area. 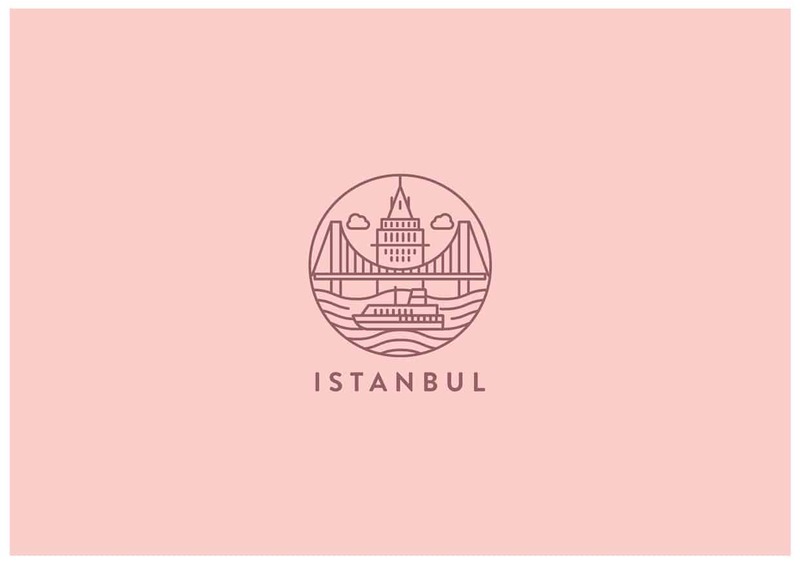 Ipek Eris is a self employed logo, brand identity and packaging designer based in Istanbul. She spent most of her life in various countries such as Kenya, France, Germany and England. After graduating with a BA in Graphic Design from the University for the Creative Arts Surrey, UK, she relocated to Istanbul in 2005 and has worked as an art director and graphic designer at international and local agencies. See more of her work on Behance or her website.